Deacon Bette Kauffman will co-chair Tuesday's meeting with The Rev. James Johnson, pastor of New Light Baptist Church. To get to New Light, go south on Hwy 165 to Winnsboro Road (a.k.a. Hwy 15), turn right, go to either 4th or 5th St., turn right again. In the first block, you'll see New Light Baptist Church, with a large parking lock and blonde brick buildings that extend from 5th to 4th St., just around the corner from Winnsboro Rd. Photo: The Rev. 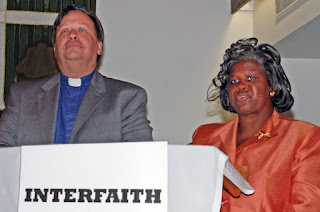 Dale Farley, Messiah Lutheran, and Minister Mary Ann Cooper, Bethel COGIC, co-chair a recent Interfaith assembly.